If you don’t already have an Easil account, sign up here. Directs you to the ‘Masters’ page. From here you can select any of the pre-designed templates to modify. Access to any designs you have worked on, with the latest at the top. Click the thumbnail to return to editing any previous designs. Click on the ‘i’ icon to view further options – renaming the file, making a copy of the design, or deleting the design. The masters page allows you to view all available Master templates in the Easil library. You can search for a specific term using the search bar, or alternatively, use the category filters. With the Masters Page open, select a master template you wish to work with by clicking on the thumbnail. Begin editing using the Easil tools! When you go return to My Designs, your newly created design is visible. Please note that the thumbnail might take a short while to update; don’t worry, your design autosaves and the thumbnail will regenerate shortly. 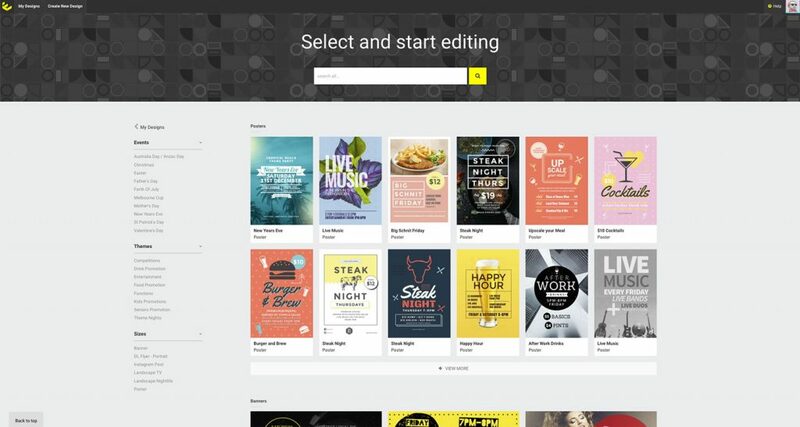 Once you have loaded a design in Easil, all of the main editing tools are located in the right sidebar. Start editing your template by simply selecting (clicking) on the elements you would like to change. A single click on any element will provide you with all the editing options that are available for that item. You can change the Opacity, Angle, Position & Scale of all Easil elements, as well as duplicate or delete any element, via the inputs and buttons in the sidebar. Different types of elements (Text, graphics etc) will have additional contextual actions available. You can place new text boxes using the Text tab, simply click on one of the new textbox size buttons. To move a text box, select it, and drag to the new position. To edit text content (characters), double click on the textbox and change the text. To confirm any change, click off the text box to apply. You are also able to do further formatting options via the sidebar. Please take note that in general, each text box can only contain one type of formatting throughout (e.g. applying “letter spacing” will affect all characters/words in the text box, as will changing the color). There are a few exceptions to this, which will be explained in further articles. Read more about working with text here. The image tab allows you to search for both photographic images and graphics in the library. Search for a keyword via the search box and place the item on the canvas by either clicking or Drag-and-drop. Once you have placed an image, you can apply filters to it, scale, crop, and reposition as you see fit. Did you know? 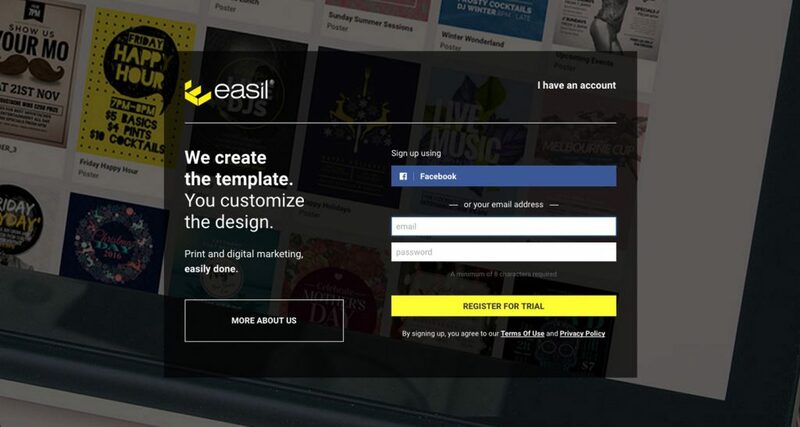 – You can use your own images on Easil! Simply use the “Upload” feature found on the Image tab on the right sidebar. Read more about working with images here. If you navigate to the Edit tab with no elements selected, the background tab will be displayed. From here, you can change the background colour, or pick a background image. Any image set as a background will automatically scale to fill the entire canvas when you create a resize of your design. Did you know? 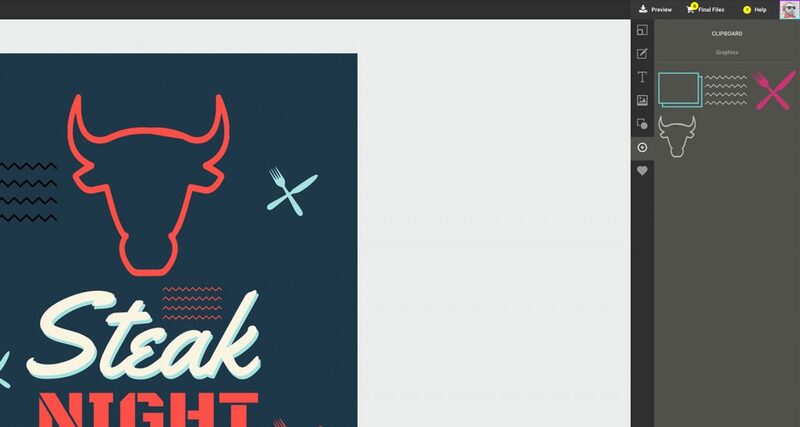 – Setting an image for a background fills the entire canvas with that image automatically. Similarly to adding images, you can search for graphic elements using the graphics tab. You can either search for a particular item using the search bar, or you can narrow your search by using the popular categories. As with images, you place the element on the canvas by clicking on it or dragging it to the canvas. Graphics have a few properties that set them apart from images. Most graphics allow you to set a new colour, and graphics with multiple colours allow you to independently change each colour. Certain graphics can also be stretched out horizontally and vertically, without distorting them. Read more about the working with graphics here. Easil gives you the ability to organise your designs with Groups and Layers. Simply click on the layers tab on the left side of the window to view the layers and groups inside your design. Properly organising your design into groups and layers makes it much easier to update your design if necessary, and to create resizes. Read more about layers and groups here. Easil provides an easy way to resize you designs to a variety of formats. To resize a design, navigate to the File tab, and click the “Resize this Design” button. The clipboard and favourites tab help you easily place elements you use regularly. The clipboard shows all assets used on your current design, across all resizes of the design. This allows you to add duplicates of any elements on your design. The favourites tab shows all elements, image or graphic, that you have marked as favourite. To mark an item as a favourite, click the small heart icon in the corner of the thumbnail when you find it during a search. 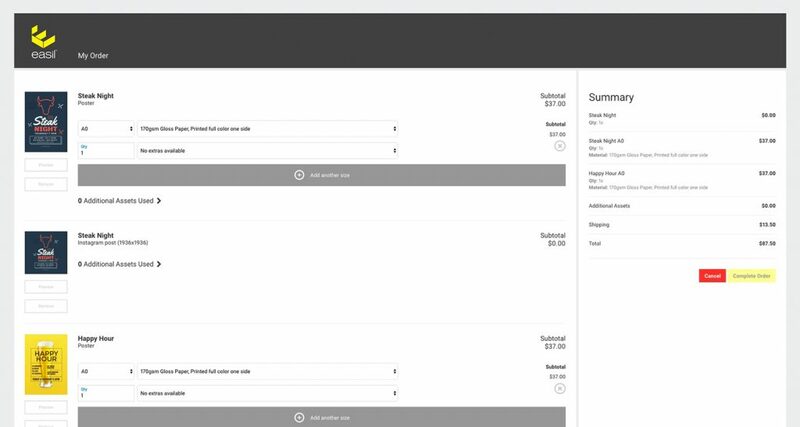 Each design completed is required to be added to your cart for downloading. 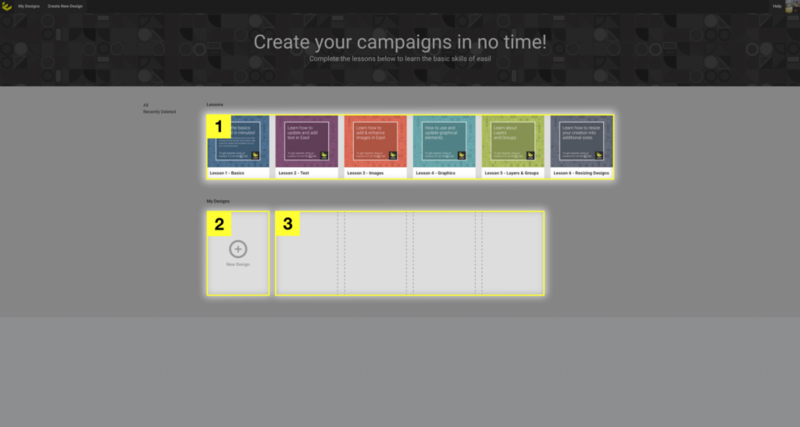 You can add a single item from one campaign, or add several elements from multiple campaigns to process and download at once.